Cambrian animals. Artwork of an Opabinia regalis invertebrate (upper right) attempting to catch its prey, a primitive chordate called Pikaia (lower left). 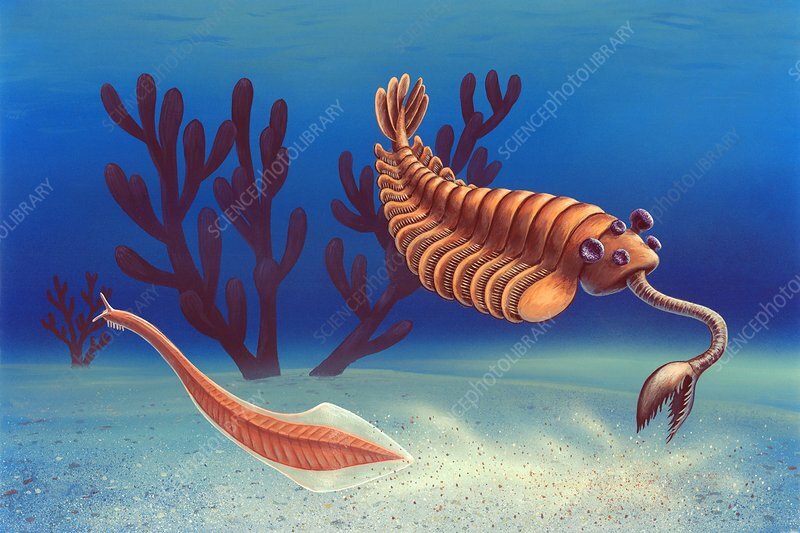 They are swimming in an ancient sea during the Cambrian Period. This period is known for the Cambrian Explosion (around 500 million years ago), the evolution of an extremely diverse array of invertebrates. Most of these went extinct, but the ones that remained formed the basis of animal life on Earth today. Pikaia is thought to have been the ancestor of all vertebrate life, including humans.